Sleep Deprivation - A serious botheration! Many people scoff at the notion that sleep deprivation has a negative impact on your body and mind – and would suggest that you drink an energy drink and power through it. We see this type of behaviour typically around college students cramming for exams and drivers who are on the road for extended periods of time. 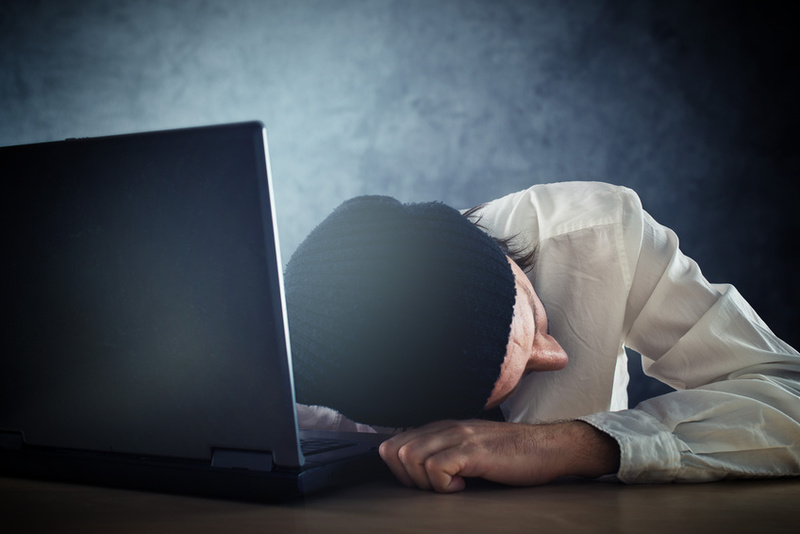 Exhausted man sleeps on laptop at office desk after working overtime. While sleep deprivation can produce significant damage to your body in the short term, over time it can lead to chronic health problems and negatively impact your quality of life. When you’re deprived of sleep, your brain can’t function properly, affecting your cognitive abilities and emotional state. Learn the dangers of sleep deprivation, its subsequent effects on your body and why you should NEVER drive while sleep deprived. If sleep deprivation continues long enough – it can lower your body’s defenses, putting you at risk of developing a chronic illness. Studies from a Harvard Medical School study show that sleeping less than 5 hours a night increases the risk of death from all causes by about 15%. Sleep deprivation leaves the brain exhausted, so it can’t perform its duties well. Sleep deprivation can interfere with your balance, coordination and decision-making abilities. Stimulants like caffeine are not able to override your body’s profound need for sleep. It can lead to higher risk of chronic health problems like high blood pressure, heart disease, and stroke. Your overall cognitive function is significantly impaired, thus stifling your creativity. It also leaves your emotions affected, making you more likely to have a short temper and mood swings. Sleep deprivation has a cumulative affect on your mind – and cannot be simply undone with sleeping in a little bit later on the weekend. In order to maintain proper cognitive function and overall mental health – it is imperative that you get at least 8 hours of sleep a night. It also goes without saying, but the information listed above will leave your motor skills impaired and can greatly impact you behind the wheel of the car. Plan ahead and take necessary precautions before driving – to ensure the safety for you and those around you. A Traumatic Brain Injury (TBI) can result from any type of car accident, motorcycle accident or commercial truck accident – and the impact of a brain injury can be extensive. When you or a loved one has sustained a brain injury, you need to focus on healing. Let our experienced team at Graves and Richard Professional Corporation, Personal Injury Lawyers look after the rest.